Hardy Kiwis are a treat and a somewhat unusual fruit we grow. 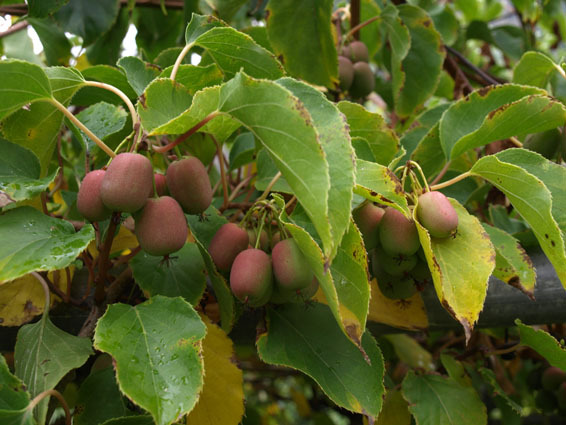 Unlike their bigger and fuzzy cousins (Actinidia deliciosa) most everyone is familiar with, we grow the Actinidia Arguta, or Hardy Kiwi, which are smaller and are fuzz-less, about the size of a big grape. I think they have a more concentrated flavor then the big ones and are easier to eat (no peeling necessary) but I may be biased. 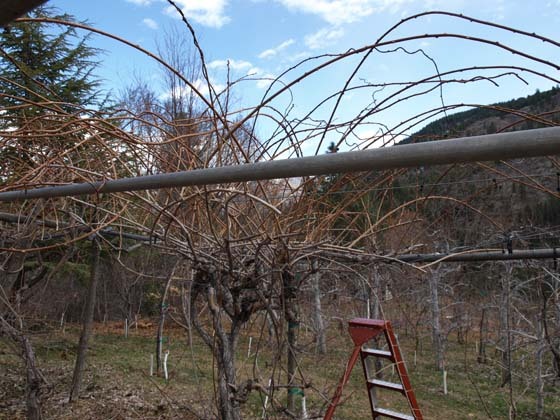 I usually prune our vines in late winter, as soon as I have a day when I can work without having to wear gloves to keep my hands warm. It takes a bit of detail work and lots of unwinding and de-tangleing the vines, so full dexterity is a must. We have cold snowy winters, so sometime in late February to early March is when it’s warm enough. In warmer climes anytime during the dormant season would be fine. 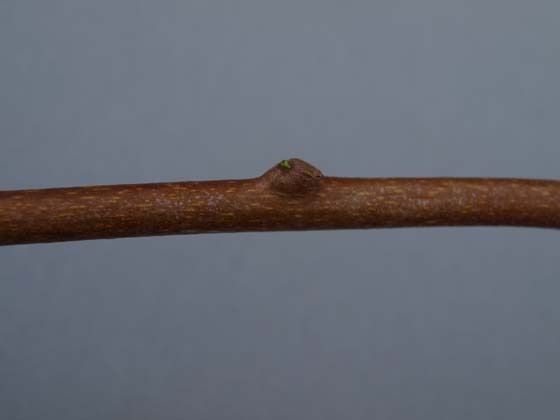 I always try to get to them before the buds begin top pop out, all the tussling required will knock off a lot of the buds if they’re beginning to bud out, the new buds will make the growth that will have fruit on it for the current season. 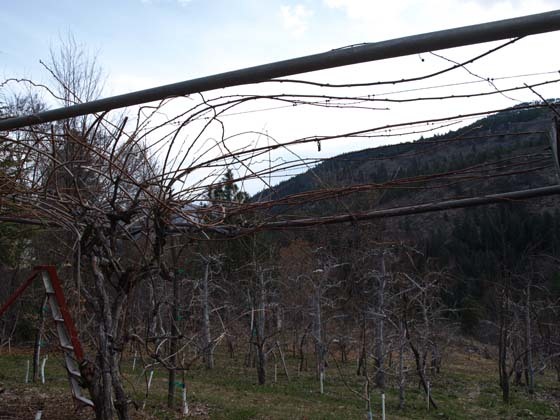 Our vines are on a trellis about six feet high with six wires about 10 inches apart, with the vines secured to the wire with plastic snap clips made for this purpose, the clips also work for grapes, raspberries etc. 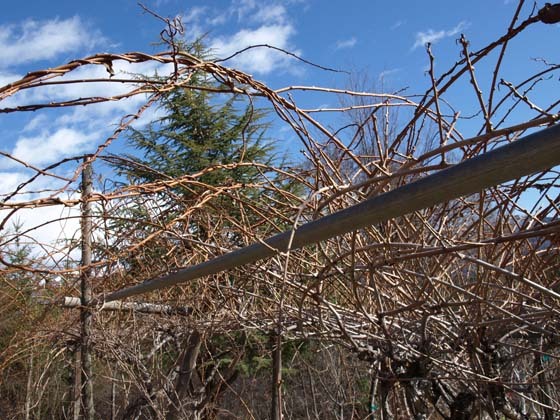 (see below) After a years growth the trellis is a mess of plant, kiwis are a vigorous grower and much of time it takes to prune the vine is devoted to untangling and organizing the vines. The first thing I do is unsnap last years growth off the wires. Kiwis will fruit on two year old and older wood, but we’ve found that we get better quality fruit form one year old vines. After I unsnap the two year old vines I cut them off back a ways, being cautious not to cut too far back yet, mostly to get them out of my way. 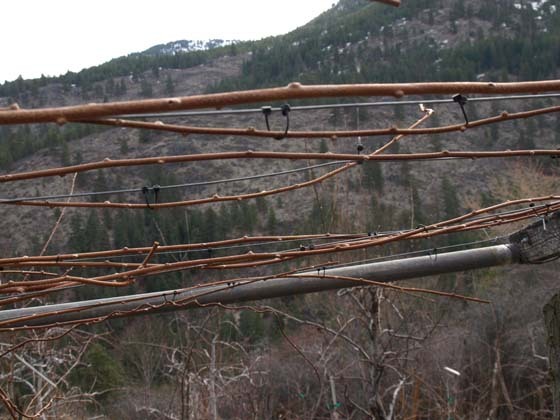 Then I go about untangling the one year old growth, which is fairly time consuming, but these are the vines which will have this years fruit on them so be gentle and patient. It’s easy to tell the difference between one and two year old wood, the one year old is smooth and the two has the spurs which had fruit on them last season. The new growth on the one year wood will make the spurs and flowers and fruit if all goes well. So basically we’re cutting the two year wood off back to where the the new wood comes out and then training the new down to the wires. 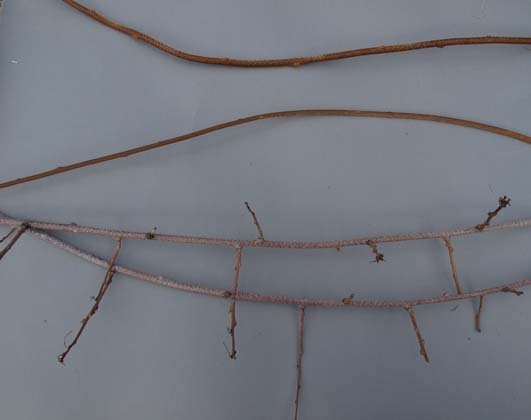 I usually put two vines on one wire, sometime three depending on how much new wood I have work with. 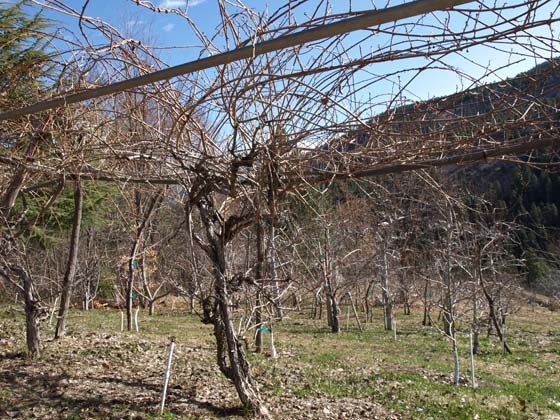 Having a lot of new wood is good, but leaving too much, and hence too much fruit, can stress the vines by over-production and result in less new vines for next year. Generally I figure that if I’m getting a lot of new growth and a good fruit load then the proportion of what I’m leaving is okay. After pruning and training it doesn’t look like theres much left, but by next year it’ll be a fine mess, with plenty of growth and potential.